Ability Handling has just supplied a new Doosan D45SC-7 diesel forklift to a leading waste management company based in Sheffield. The new truck is ftted with Doosan's innovative G2 engine that does not require a DPF filter in order to meet the Euro IIIB emmissions standard. Working in a particularly tough environment, it is testament to Doosan's rugged design and reliability that the old Doosan machine it replaces has been able to operate well beyond its budgeted life thereby providing exceptional value for money. 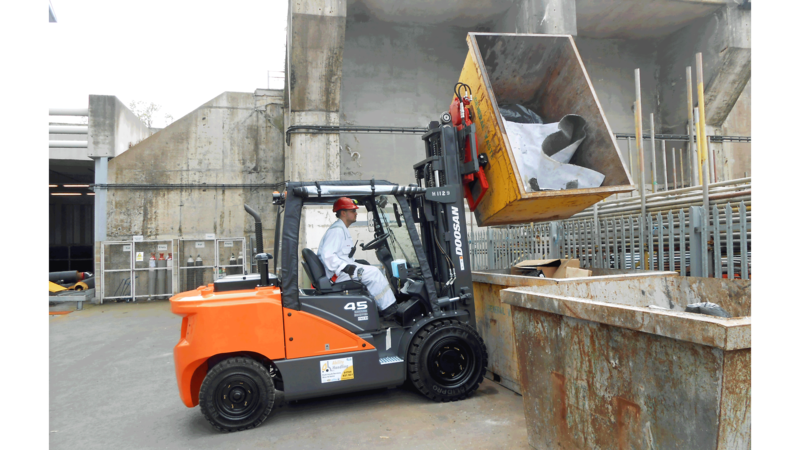 The machine is primarily employed for unloading household waste skips from lorries and tipping the contents into storage containers ready to be processed for use in energy generation. The machine has been specifically configured for this application with its 1500mm long forks able reach over half way across the lorry bed to safely lift the waste skips. Once across the yard, the ATIB rotator allows the skips to be immediately emptied into the storage containers and then return them for reuse. The weatherguard cab and canvas doors provide weather protection for the driver while the low triple mast also allows the machine to operate inside the facility if required. While providing more power output than the previous generation engines, the new Doosan G2 diesels are more efficient and this results in a 30% reduction in fuel consumption. In addition, with longer service intervals and an extended drive train warranty, the G2 offers significantly reduced operating costs; so now you really can save money while helping save the environment. Ability Handling are one of the leading independent Doosan forklift dealers in the UK and are able to supply new and used trucks from stock. Our expert team provide clear, relevant advice on choosing the best model for any given situation and always deliver the most professional customer service. Find out more about Doosan forklift trucks on our website or contact us today to start your Doosan journey.